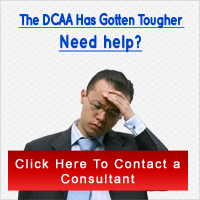 The contractor is required by DCAA to have a subsidiary job-cost or accounts receivable ledger. This ledger must accumulate costs by the contract at the level that was in the contractorâ€™s DCAA proposal. Some DCAA contracts require that the contractâ€™s costs can be identifiable by item and unit as though each item were part of a separate contract. For example, manufacturing contracts may be required to segregate costs by preproduction.